O God, Father of mercies, who placed your people under the singular protection of your Son's most holy Mother, grant that all who invoke the Blessed Virgin of Guadalupe, may seek with ever more lively faith the progress of peoples in the ways of justice and of peace. Through our Lord Jesus Christ, your Son, who lives and reigns with you in the unity of the Holy Spirit, one God, for ever and ever. In 1910 Our Lady of Guadalupe was declared Patroness of Latin America, and in 1945 Pope Pius XII declared Her to be the Empress of all the Americas. She appeared to an Indian convert named Juan Diego on December 9, 1531. She left a marvelous portrait of herself on the mantle of Juan Diego. This miraculous image has proved to be ageless, and is kept in the shrine built in her honor, the Basilica of Our Lady of Guadalupe. "Hear me and understand well, my son the least, that nothing should frighten or grieve you. Let not your heart be disturbed. Do not fear that sickness, nor any other sickness or anguish. Am I not here, who is your Mother? Are you not under my protection? Am I not your health? Are you not happily within my fold? What else do you wish? Do not grieve nor be disturbed by anything." In the winter of 1531, a poor, 57-year-old Aztec Indian living five miles outside of Mexico City encountered a miraculous happening on his way to morning Mass. First he heard strange music coming from Tepeyac Hill, and then he heard a woman's voice calling his name. Juan Diego climbed the hill and encountered a young woman, appearing to be of his own people in physical appearance and dress. The woman identified herself as the Virgin Mary, and told Juan Diego to ask the bishop of Mexico City to build a church on the hill to assist in the conversion of the nation and be a source of consolation to the people. Juan Diego obeyed the request, but the bishop was skeptical regarding the message, even though he perceived that Juan was a humble, and well meaning Catholic. Juan reported the bishop's doubt to Our Lady at Tepeyac Hill, and she asked him to return to the bishop once again, bearing the same message. The bishop once again heard the story, and told Juan Diego to ask Our Lady for a sign that it was indeed herself that wished for the church to be built. When he returned to the hill, Mary gave Juan Diego such a sign. Miraculously, roses appeared on the hill in the middle of winter, and Juan gathered them in his tilma, or cloak. Our Lady arranged the roses in his tilma with her own hands, and Juan returned to the bishop's presence. 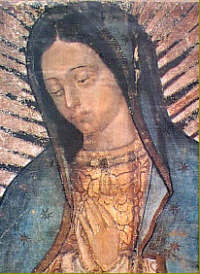 When Juan released the tilma, allowing the flowers to fall to the floor, it was revealed that a miraculous image of Our Lady had imprinted itself on his tilma (see above). The bishop immediately fell to his knees, and came to believe in Juan Diego's message. A church was built on the spot of the apparition, as Mary had requested, and 8 million people converted to Catholicism in a short period of time upon hearing of or viewing the miraculous image of Our Lady. The tilma of Juan Diego has been the subject of much modern research. The tilma, woven out of coarse cactus fiber, should have disintegrated after 20 years, but although over 500 years have passed the tilma is still in perfect condition. The pupils of Mary in the picture reflect the Indians and clergy present at the time of the first revelation of the image. No paint was used, and chemical analysis has not been able to identify the color imprint. Additionally, studies have revealed that the stars on Mary's mantle match exactly what a Mexican would have seen in the sky in December of 1531. Patron: The Americas; pro-life movement. Start a novena to Our Lady of Guadalupe. If you live close to La Crosse, WI visit the beautiful Shrine of Our Lady of Guadalupe; if not make a virtual visit. Read more about this title of Our Lady. Make a sacrifice, say a prayer or visit the Blessed Sacrament for an end to abortion. If your parish is having a pro-life Mass or holy hour try to attend. Have a party, which includes a procession and a special Mexican dinner to celebrate the feast. See Celebrating the Feast of Our Lady of Guadalupe for ideas. He was still young when he took the monastic habit in the neighboring monastery of Saint Anthony. No persuasion could convince him to return home when his father came to attempt that move, and the Abbot, recognizing that his firmness was of divine origin, said to the monks, Let us not reject the gift of God. His father eventually was present when he received the tonsure, and shed It was soon visible to all that God destined him for some high role in the Church. He left for a more distant monastery in. Auxerre, and there he seemed to live a life more angelic than human. A rich lord of the region, after talking with him one day, disposed of his entire fortune without even returning home, to embrace religious poverty. Among the primitive teachers of the Irish church the name of St. Finian is one of the most famous next to that of St. Patrick. He was a native of Leinster, was instructed in the elements of Christian virtue by the disciples of St. Patrick, and out of an ardent desire of making greater progress passed over into Wales, where he conversed with St. David, St. Gildas, and St. Cathmael, three eminent British saints. After having remained thirty years in Britain, about the year 520 he returned into Ireland, excellently qualified by sanctity and sacred learning to restore the spirit of religion among his countrymen, which had begun to decay. Like a loud trumpet sounding from heaven, he roused the sloth and insensibility of the lukewarm and softened the hearts that were most hardened, and had been long immersed in worldly business and pleasure. To propagate the work of God, St. Finian established several monasteries and schools; the chief of which was Clonard, in Meath, which was the saint’s principal residence. Out of his school came several of the principal saints and doctors of Ireland, as Kiaran the Younger, Columkille, Columba, the son of Crimthain, the two Brendans, Laserian, Canicus or Kenny, Ruadan, and others. St. Finian was chosen and consecrated bishop of Clonard. The great monastery which he erected at Clonard was a famous seminary of sacred learning. St. Finian, in the love of his flock, and his zeal for their salvation, equalled the Basils and the Chrysostoms, was infirm with the infirm, and wept with those who wept. He healed the souls, and often also the bodies of those who applied to him. His food was bread and herbs, his drink water, and his bed the ground, with a stone for his pillow. He departed to our Lord on the 12th of December, in 552, according to the Inisfallen Annals, quoted by Usher, but according to others in 564.